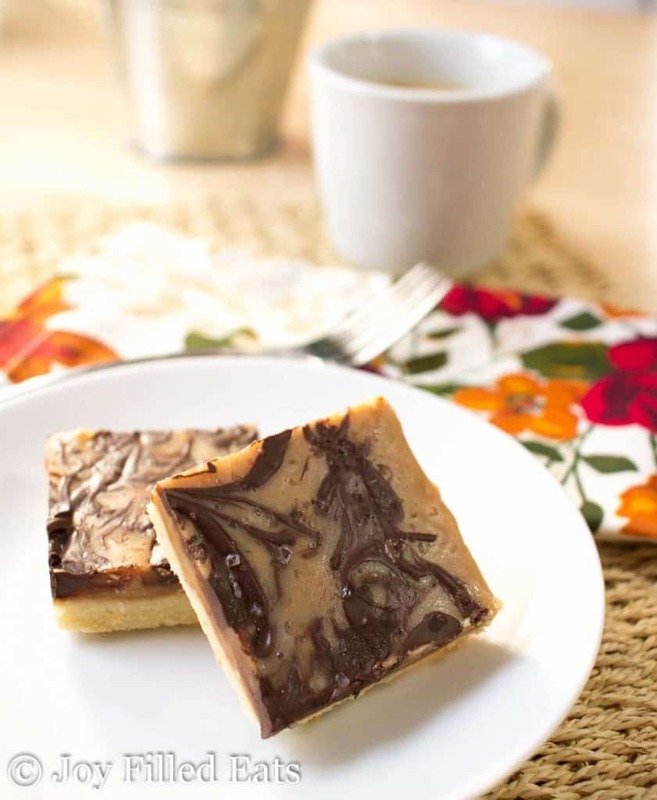 These Salted Caramel Shortbread Squares are simply amazing. 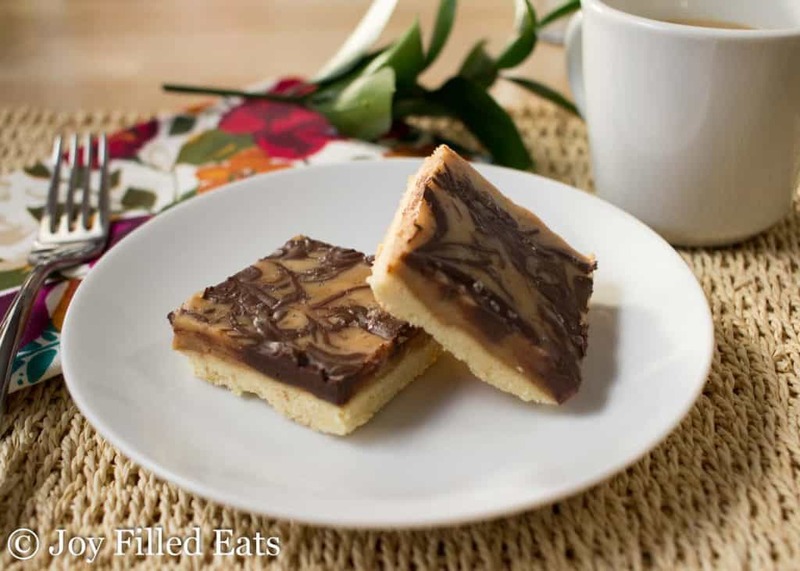 With a buttery crust and a beautifully swirled topping of caramel and chocolate dusted with sea salt, they look like a treat from a fancy bakery. Any time I have heavy cream to use up the first things I think of is ice cream or caramel. Since my freezer is packed and my ice cream maker bowl is not frozen I simply had to make caramel this time. Oh, what a sad day it was. Not. I’ve been wanting to make a caramel bar for some time so I whipped up my Easy Pie Crust, poured some homemade caramel sauce on top, swirled in chocolate, sprinkled with sea salt, and called it a day. A very nice day it was. I love the gorgeous swirls on these bars and the way the sea salt glistens in the light. They are delicious, easy to make, and pretty. Those are the best kinds of desserts. 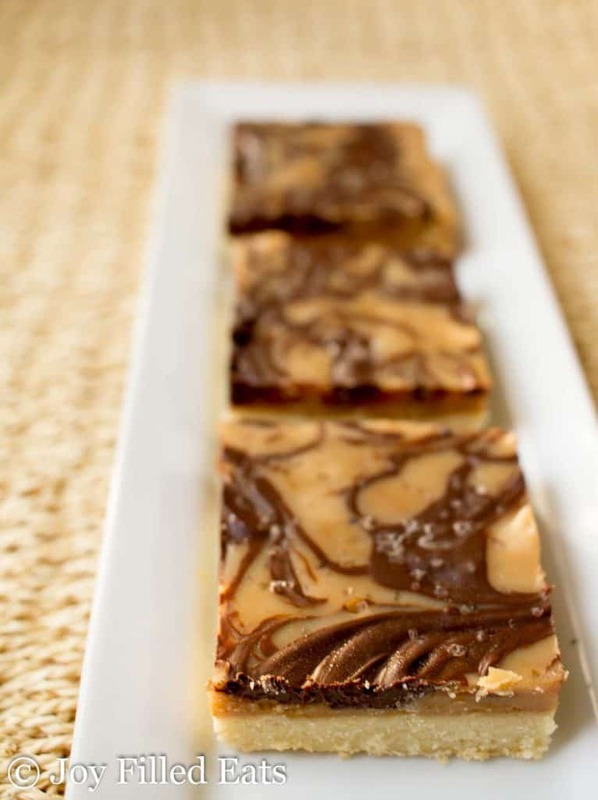 The crust for this salted caramel shortbread can seem dry when you process it in the food processor. Don’t worry! Just keep the machine going and within a few minutes, it comes together into a dough. I’ve made this dough dozens of times and it always comes back together as the butter gets cut by the food processor blade. The color of homemade caramel is so vibrant. I love the sweet smell of it bubbling away on the stove. I know that my caramel is done when it is thickened, fragrant, and starts to get very dark bits at the bottom when whisking. The perfect caramel is done just a few seconds before it starts to burn. Don’t leave this unattended once it starts to thicken and change color. That’s the time to watch it and whisk. You can use any type of sugar-free chocolate in this recipe. If you prefer very dark chocolate or milk chocolate to semi-sweet just substitute a similar amount for the chocolate chips. 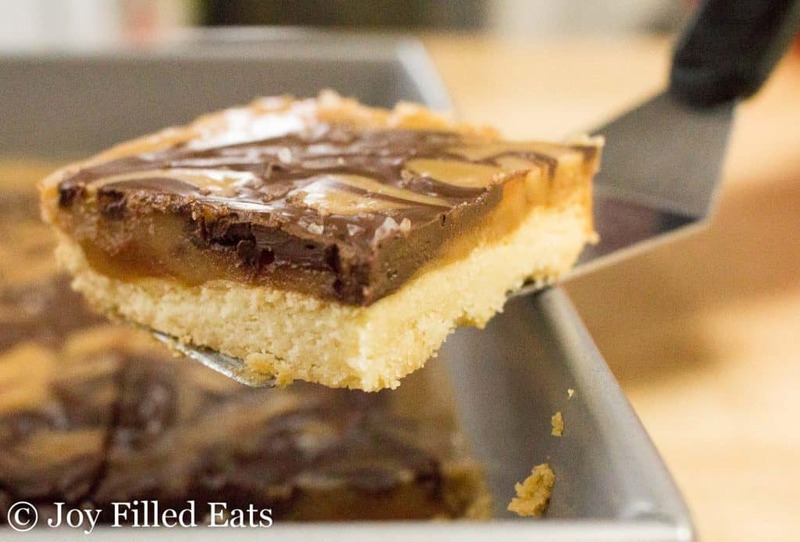 If you don’t like chocolate (I knew someone like that once) feel free to leave it off and just make a salted caramel shortbread. I really want to try these without the chocolate and with some thinly sliced apple in the layer of caramel. I think it would give them a nice texture and only increase the carbs a little bit. 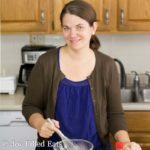 In my dessert recipes, I normally use Trim Healthy Mama Gentle Sweet which is a combination of xylitol, erythritol, and stevia or my own sweetener blend of the same three ingredients. My sweetener can be switched with Gentle Sweet in any recipes. 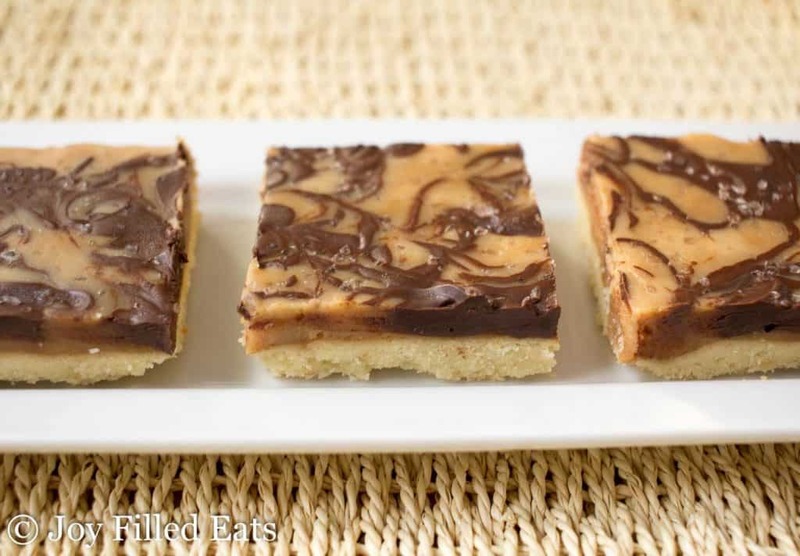 I have not tested this salted caramel shortbread recipe with other sweeteners. Most sugar alcohol based sweeteners should work but you may have to adjust the quantity. My sweetener blend is twice as sweet as sugar. If the sweetener you prefer is equal to sugar you will need to increase the amount. Preheat oven to 350. 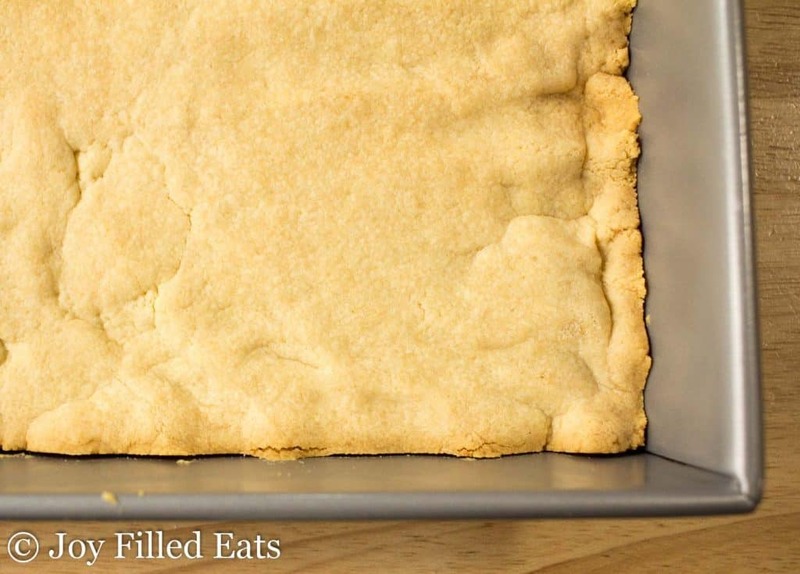 Line the bottom of a 9 inch square cake pan with parchment paper. Mix the crust ingredients in a food processor until the dough comes together. Press into the bottom of the prepared cake pan. Bake for 16-20 minutes at 350 degrees until golden brown. Cool completely. Meanwhile, combine the sweetener, cream, and butter in a medium saucepan. Cook over medium, stirring frequently, until deep golden brown and thickened. Depending on the heat of your stovetop this can take 10-15 minutes. Watch it carefully. Remove from the heat and add the vanilla. Cool for 5 minutes. 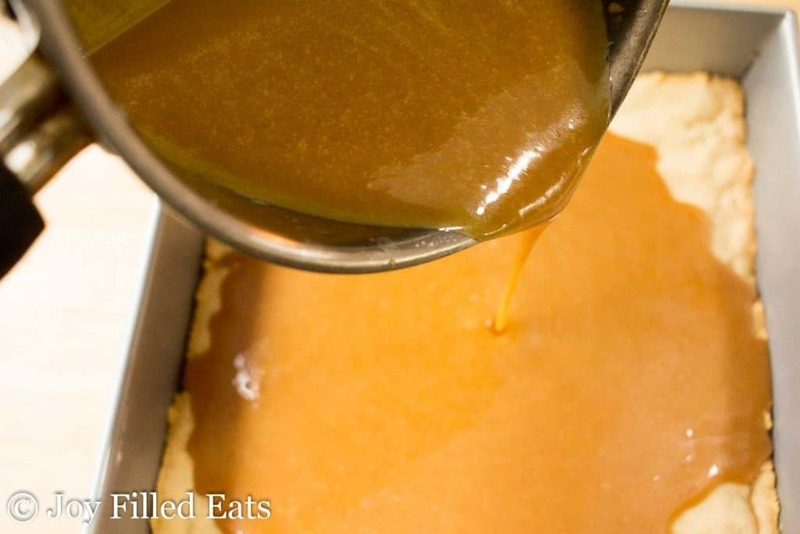 Pour the caramel over the cooled crust. Put dollops of the melted chocolate ever inch or two. Use a butter knife to gently swirl them together. Sprinkle with the sea salt. Store at room temperature for 2-3 days. 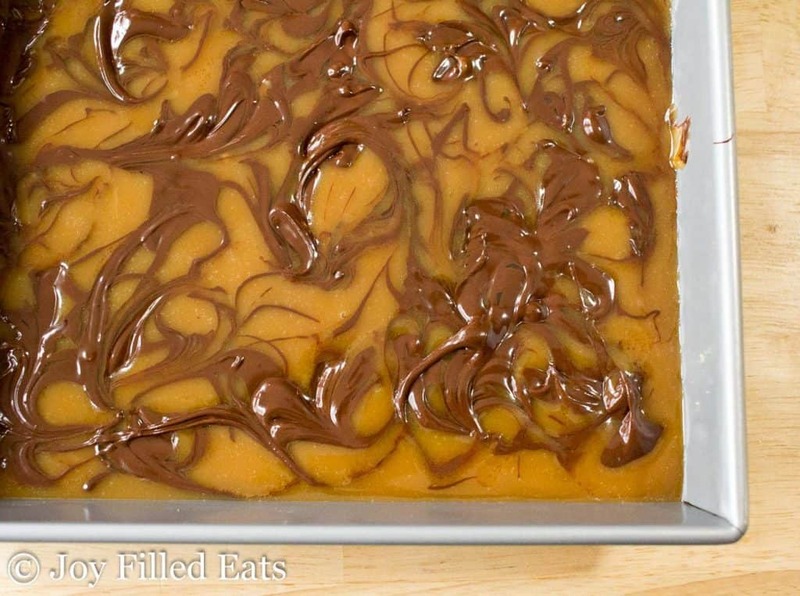 You can refrigerate for longer storage but the caramel will firm up. The crust for this can seem dry when you process it in the food processor. Don't worry! Just keep the machine going and within a few minutes, it comes together into a dough. Hey these are great. I made them for church and my friend who is also on thm can’t have dairy except for butter. I swapped out the heavy cream with canned coconut milk and used 1/2 the amount of pyure instead of gentle sweet or your sweetener. They turned out perfect. I also used 85% dark chocolate melted with a little coconut milk and some sweet instead of the chocolate chips since I didn’t have any. It was all really good. So for anyone mostly dairy free who can have butter it will work with coconut milk. And anyone who doesn’t have any sweetener other than pyure, use half the amount and it works great. I have Pyure as a sweetner. How much would I use- does it measure 1:1 with gentle sweet? Hi Jenny, I do not recommend switching sweeteners for caramel recipes. I only test my recipes with a blend of xylitol, erythritol, and stevia so I don't know how other sweeteners will react. I think pyure is 1:1 for gentle sweet but I don't know how it behaves when melted and cooked into a caramel. Aww. I'm sorry! Caramel is tricky. I'm hoping my next cooking video will show how to make it. Sometimes you can save it by whisking in some xanthan gum and extra cream. These are sooo good! I will be making these constantly. Thank you for this recipe! What's the recipe for your sweetner, for the carmel? Am I sub out THM baking blend 1:1? Baking blend should work. I would use a little less since it can be drier than almond flour. 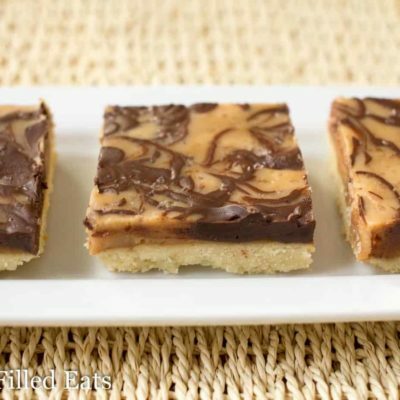 Tried these this afternoon but my caramel never browned or thickened. I accidentally added the vanilla at the beginning, would that have caused it to not "caramelize"? Hi Jodi, Were you using gentle sweet? Adding the vanilla at the beginning shouldn't make that much of a difference. Subbing in a different sweetener won't work. I've made this caramel at least 20 times and it always works with a blend of xylitol, erythritol, and stevia. I used super sweet. I don’t keep Gentle Sweet in the house because of the dogs. Maybe that was it. Yes. It doesn't have the bulk needed. You could add more erythritol or use the new xylitol free gentle sweet. Well, I put it in the fridge and it turned up. I have yellow caramel that tastes perfect! That’s what counts! Absolutely the BEST bar recipe yet!! This is hands down my favorite one...perfect combo of sweet and salty. I didn't even wait til completely cooled....to excited to try it. I also ran out of heavy cream and had to use 1/2 cup of 18%, so look forward to full cup of heavy cream. Thank you so much for generously sharing your recipes with us!! Heaven in a bar! Yum!